Vilseck High School students pose in front of Hopfenohe Church ruins. Several students from Susan Holt’s Biology class and the Environmental Club spent a foggy morning touring the Grafenwoehr Training Area in November. 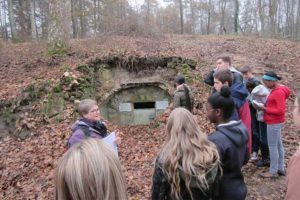 GRAFENWOEHR, Germany — Several Vilseck High School students from Susan Holt’s Biology class and the Environmental Club spent a foggy morning touring the Grafenwoehr Training Area in November. Environmental Division staff focused on native wildlife and habitat management, as well as the area’s historical past. Caecilia Kastl-Meier and Christine Fox, both from the Environmental Division team, created a memorable experience for the students by bringing history and science to life. Now, what lurks beyond the boundary signs is no longer a mystery to these students. Students stepped back in time as Kastl-Meier showed them traces of the once bustling villages of Haag and Hopfenohe. In the 1930s, the Third Reich required villagers to leave their homes in order to extend the training area, which was originally established in 1910 by the 3rd Royal Bavarian Army Corps. Caecilia Kastl-Meier of the Environmental Division explaining the importance of protecting bat hibernation sites, like this old cellar in Haag village. With the exception of a few former village structures that were stabilized from further dilapidation, many of the buildings have been reclaimed by nature. Today, trees and shrubs pierce through the remains, disguising the past. 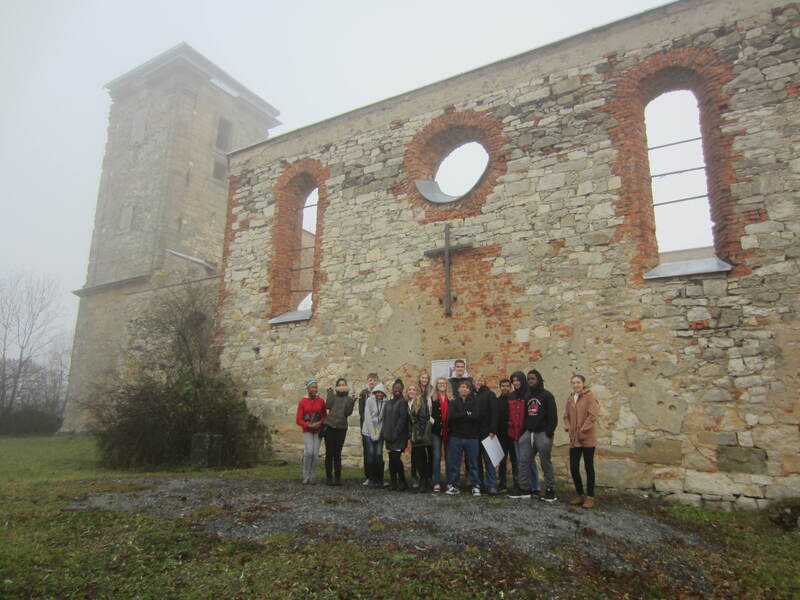 Students explored Hopfenohe’s church ruins, preserved in 2005 for future generations, and learned about the project to protect heirloom apple trees in the nearby orchard. The high schoolers discovered that some village preservation projects also benefit wildlife. Kastl-Meier explained that threatened bat species use old cellars in Haag as hibernation locations and the Environmental Division has worked since the late 1990s to stabilize these cellars to protect the bats. As the bus navigated the training area’s bumpy gravel roads, students saw firsthand the diverse habitats – forests, meadows, wetlands – scattered throughout the ranges and impact areas. They learned the training area has a higher amount of biodiversity, with more plant and animal species living here than in the surrounding German landscape. They learned that how the training area is managed makes all the difference – it is not cultivated for crops, pesticides and fertilizers are not used, and it is a large area without much human interference, Fox said. At a stop along the southern boundary line, students could see the recognizable difference between the cultivated agricultural landscapes outside of the training area versus the varied habitats inside it. And to top off an already great day, the fog lifted at the final tour stop, rewarding everyone with impressive views from Bleidorn Tower, one of the highest viewpoints in the training area.